Posted November 28, 2018 under Ask Us. Congratulations on being proactive about your health! It may seem like getting a cold is unavoidable when people around you are coughing and sneezing; however, there are measures you can take that will decrease your chance of getting sick. If you haven’t had the flu shot yet, see your health care provider and get vaccinated. Avoid sharing water bottles, lip balm, drinks, food, utensils and other things that could pass viruses. Wash your hands frequently and avoid touching your face so that any germs on your hands don’t get passed on to you. If you get sick anyway cough into your arm not your hands and wash your hands often. These are the best ways to lessen your chances of getting and spreading germs. Also boost your immune system and get 8-9 hours of sleep, eat balanced meals with lots of fruits, veggies and whole grains, exercise regularly, and lower your stress. If you smoke, quit and avoid second-hand smoke. If you do get sick, follow our health guide and talk with your health care provider. 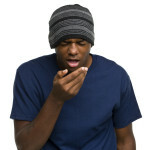 There are several different types of OTC medicines (medicine you can buy without a prescription) that can lessen the symptoms of the common cold and the flu; however, check with your health care provider first.